An arctic cold front is headed into the ArkLaTex to start off the weekend. Storms are likely ahead of the front tonight with falling temperatures during the day tomorrow. Showers and storms will be on the increase tonight. A few strong storms capable of hail and perhaps some strong wind gusts are possible. Temperatures will hold in the ow 60s most of tonight before falling back into the 50s late. The chance for rain is 70%. Rain will end early Saturday morning for most of the area. Much colder air arrives as a northwest wind picks up to around 15-25mph. Temperatures will start in the low to mid 50s in the morning, but drop into the low 40s by afternoon. Some lingering moisture early in the day around the I-30 corridor could end with a few snowflakes. No accumulations are expected. Temperatures will fall into the mid to upper 20s Saturday night with clearing skies. We’ll enjoy plenty of sunshine on Sunday, but it will be chilly with afternoon highs in the mid to upper 40s. Sunshine continues for Monday with highs bouncing back into the low to mid 50s. More rain and shots of colder air are expected off and on next week. 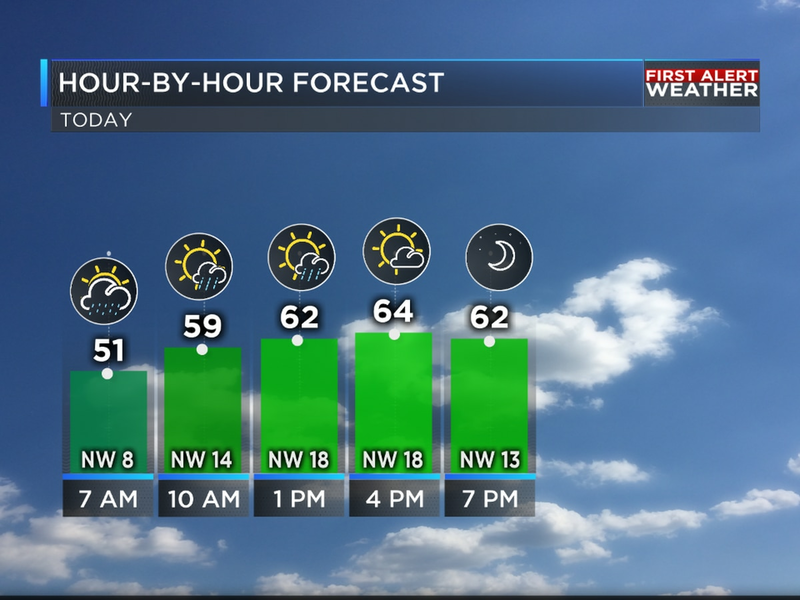 Rain returns on Tuesday with highs in the 50s. We’ll begin to dry out again on Wednesday, but expect a colder day with highs in the 40s. The end of the week is looking dry and cool with highs in the 50s. Plenty of sunshine left of your Saturday. Temperatures will be in the 70s until sunset, then temperatures cool into the 60s. Lows tonight drop into the low 50s.Easter Sunday will have just as much sunshine as today. Temperatures will be a bit warm near 80 degrees across the area.